The Roman Catholic Diocese of Dallas has issued guidelines to all parishes in regards to Faith Formation and Preparation for receipt of Sacraments. These guidelines require children to be enrolled in a formal Faith Formation program for one full year prior to the year of preparation and receipt of the sacraments of Reconciliation, Eucharist. We therefore strongly encourage you to enroll your child in our Faith Formation program no later than 1st grade so that he/she will begin learning about their faith and will be on track to receive the Sacraments of Reconciliation and Eucharist when they are in the 2nd grade (the traditional age to receive these sacraments for the first time). 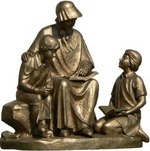 If your child is currently in the 2nd – 5th grades, and has not received these sacraments, please contact the Children’s Ministry office for information about sacrament preparation. We have options to offer to prepare your child for sacraments within the Diocesan guidelines and within our program. If your child has not been Baptized or was Baptized in a faith tradition other than the Catholic Church, please contact the Children’s Ministry Office. Please know that all are welcome in the Seton Faith Formation Program. At whatever point you and your family are in your faith, we are here as you continue your journey. Before your child receives the sacraments parents will be asked to fill out and return the Sacrament Information Form. A copy of the child&apos;s Baptismal Certificate must be attached to the form if your child was baptized in a parish other than St. Elizabeth Ann Seton. If your child was Baptized in another Christian Church, please attach a copy of the certificate and contac tDenise Gilbert at 972-596-5505 ext. 4264. The forms should be returned to the Children&apos;s Ministry Office. They are due by October 31st the fall before First Communion. If your child misses a session, it is expected the lesson will be made up. You can make up the class any day of the same week (Sun - Wed) or if that is not possible, simply go over the missed lesson at home with your child. Please do so in a timely manner as some of the lessons are not meaningful if you wait too long to complete them (i.e. the Advent or Christmas lessons. Reconciliation lessons are no longer relevant once the child makes the Sacrament). Your child should attempt one of the suggested activities at the end of the chapter and show it to his Catechist the next time he attends Faith Formation. If the lesson is not in the book, contact the Children&apos;s Ministry office to obtain the lesson. Let the registrar know that you have made up a lesson at home. The registrar will make the appropriate notation on the attendance sheet and change the attendance files. You may email at mparisee@eseton.org or call the Children&apos;s Ministry Assistant/Registrar, Michelle Parisee at 972-598-5505 Ext 4260. RCIC (Rite of Christian Initiation for adults adapted for Children) is for children who have not made their sacraments of initiation (Baptism, First Communion, and/or First Reconciliation), who have completed 2nd grade and are enrolled in either 3rd, 4th or 5th grade, whether baptized or unbaptized. The class prepares the Children to receive the Sacraments of First Reconciliation and First Holy Communion, which they have missed since Baptism, or to join the Catholic Church through Baptism. Preparation is one year of classes held each Sunday from 10:15am – 11:15am, where the parent and child attend together to grow in their Catholic Faith and with their community. The children will attend RCIC classes on a regular basis beginning in September and continuing through the Easter Season, with holiday breaks. If your child has not received these sacraments, or has not been Baptized, please give Denise a call at 972-596-5505 ext. 4264.